I’m going to take a bit of a nail break the rest of the year. I wore myself out this month with the challenge and my swatching in between. I have a couple of nail breaks on my right hand from opening boxes yesterday so I’m going to chop them all down to nubbins and leave them oiled up and naked for a few days. Luckily my nails grow really fast so they wont stay short for long. Before I do that though, I wanted to fulfill a couple of requests. 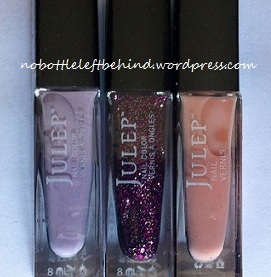 My first request was the Julep Mystery Glitter. Some people had stickers on the bottom of theirs that said this glitter was called Erica. Mine didn’t have a sticker. Erica is a clear base full of black micro glitter that almost makes this polish look like it’s in a black base. There are gold, bronze, and silver glitter throughout as well. I did a little comparison in this picture also. On my index and ring finger I used one coat of black polish then one coat of the mystery glitter. 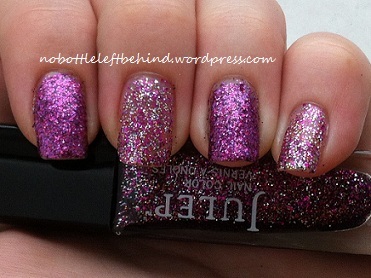 My other 3 fingers are just two coats of the mystery glitter. You really can’t tell the difference. Personally, I like the way it looks layered over the black polish though so that’s probably how I’ll be wearing this one. It will save on polish too! 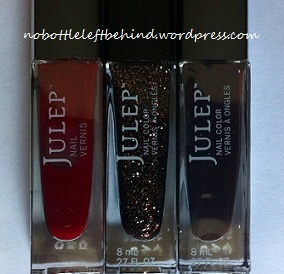 My next request was a swatch comparison of Julep Barbara and Chelsea. When I opened my mystery box and saw Chelsea I thought it looked just like Barbara (in my head). But once I finally got out my bottle of Barbara I realized they were different after all. Then when I actually swatched them side by side on my nails you could REALLY see the difference. They’re not alike at all. My index and ring finger have Barbara and my middle and pinky fingers are Chelsea. 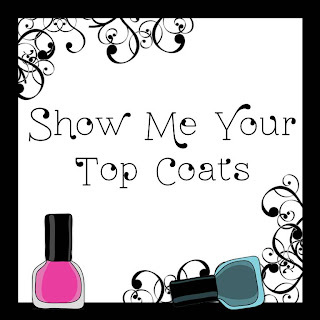 All are two coats, no undies.